We continue to invest in technologies that allow us to be as creative as possible for our customers. 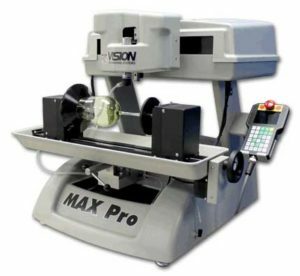 We’ve made a significant investment in a new Vision Max Pro engraving machine. The Max Pro Engraver is an incredibly versatile engraving machine. We can now engrave flat, deep, round or odd shaped items. We’ll be using this machine to engrave inscriptions in our custom jewelry, but there are many additional applications. We can engrave plastic, brass, coated materials, artificial stone, crystal and more. Some common uses include glass engraving, cylindrical engraving, sign making, medals, trophies and plaques, badges, wood, plastic, metal and more! As a result, we’re providing engraving as a new service to our customers. If you have an item that you would like to have engraved, give us a call! Pumpkin Spice Latte? House of Diamonds Coffee Mug!